On Sunday, Feb. 1 at 2:14 a.m., a traffic accident was reported on the 400 block of Swede Alley. A vehicle collided with a column, the police said. Nobody was injured. A police officer stopped a taxi reported to be operating without the proper license on the 500 block of Swede Alley at 1:15 a.m.
A suspected intoxication case was reported on the 600 block of Main Street at 12:53 a.m.
A loud party was reported somewhere along Woodside Avenue at 12:43 a.m. The party ended prior to the police arriving. The police at 12:42 a.m. received a report of an assault at a Main Street nightclub. The victim was treated and released. The police said a suspect was arrested on charges of assault, intoxication and refusing to leave a bar. The smell of natural gas was reported at a hotel on Park Avenue at 12:36 a.m. 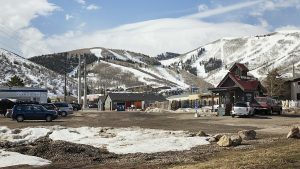 The police and the Park City Fire District responded. Firefighters discovered a heating, ventilation and air conditioning system was not venting properly, the police said. The equipment was shut down. Low levels of carbon monoxide were detected, according to the police. People in that area of the hotel were contacted. None of them complained they did not feel well. The Fire District vented the area with fresh air. On Saturday, Jan. 31 at 11:17 p.m., a loud party and fireworks were reported on Cochise Court. The police classified the case as disturbing the peace. The people involved were warned. A hit-and-run traffic accident was reported on the 1300 block of Lowell Avenue at 5:18 p.m. The other driver left information. Earlier that day, at 11:15 a.m., a hit-and-run accident was reported on the 2200 block of Deer Valley Drive. The accident occurred the day before. The police were told the front and rear door on the driver’s side was damaged. On Friday, Jan. 30 at 8:39 p.m., the police received a report about a woman riding a horse in the middle of the road along Three Kings Drive. The horse "appears to be out of control," the police were told. An officer found the woman on a horse, who indicated she was attempting to signal a plow driver to slow down so the horse would not be startled, the police said. At 9:33 a.m., the police received a complaint about a taxi on Royal Street not stopping at stop signs and driving recklessly. Someone contacted the driver in a hotel parking lot prior to the police arriving. The taxi driver apologized and left. The person did not want to further pursue the case. At 9:55 a.m., a car was reported to be driving in a reckless manner on Prospector Drive, swerving back and forth and running stop signs. The driver swore out the window as they passed the person who called the police, according to Police Department logs. At 2:06 a.m., a suspected drunken driving case was reported at the intersection of Deer Valley Drive and Park Avenue. Public police logs did not provide details. The Police Department at 12:51 a.m. were summoned to a nightclub on Main Street, where someone reported a security guard injured them. The police found that the person had acted in a disorderly manner and sprayed a beverage onto a crowd. He was forcefully removed from the nightclub after "being combative," the police said. The nightclub declined to press charges. Someone at 12:24 a.m. reported that security guards at a Main Street nightclub assaulted someone. The police interviewed people and determined that the report was unfounded. On Thursday, Jan. 29 at 8:46 p.m., the police received a complaint about a dispute between a taxi driver and a passenger about the fare. The situation was resolved without police action needed. A bus driver was reportedly assaulted along Park Avenue at 7:23 p.m. The driver declined medical treatment. 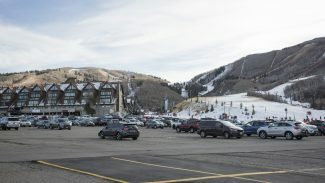 The bus was contracted to work during the Sundance Film Festival, the police said, but it was not clear from public police logs what sort of route the bus was hired to drive. Skis were reported stolen on Lowell Avenue at 1:35 p.m.
At 12:28 p.m., someone told the police they were assaulted by a coworker. The case was logged on Main Street. The police said a large knife was displayed but not used. The police arrested a suspect and booked the person into jail on assault and weapons charges, the police said. At 7:50 a.m., a person was seen sleeping in a vehicle on the 1300 block of Sullivan Road. The engine was running, the police said. The person told the police she was sleeping prior to work. The police informed her of a law against vehicles idling. On Wednesday, Jan. 28 at 2:47 p.m., someone reported seeing protesters on Main Street. The police were apparently told the people were part of a publicity stunt promoting a film. They were gone by the time the police arrived. At 2:07 a.m., a trailer with a large number of people around it was seen on Main Street. 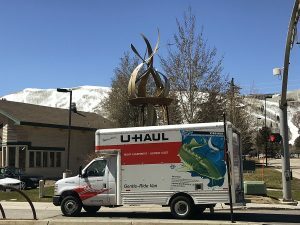 The trailer was parked in a no-parking zone and music could be heard. The police classified the case as disturbing the peace. The people agreed to leave. On Tuesday, Jan. 27 at 10 p.m., a purse was found on Main Street. It was turned in to the police. A rollover accident was reported at the intersection of Bonanza Drive and Deer Valley Drive at 2:24 p.m. Nobody was injured, the police said. On Monday, Jan. 26 at 9:38 p.m., an assault was reported on park Avenue. Public police logs did not provide details. 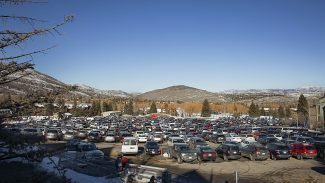 Two suspected drunken driving cases were logged in Park City in the early morning hours. One was logged at 3:16 a.m. on the 2000 block of Park Avenue. The other was on the 200 block of Daly Avenue at 1:29 a.m.